Setting up a React project from scratch can be a daunting task for beginners. Lots of npm modules to install, lots of configuration and other tasks. There are lots of react project seeds we can use in place of starting a project from scratch but then they come with a lot of boilerplate hard to make sense for a beginner who is just starting out. I was rebuilding my personal website in react and come with the idea to share with you all how I will be building that project from scratch. The entire tutorial code is hosted on Github here. let’s start by creating a node project. In your terminal type these command. In the above snippet firstly we are creating a directory named reactProjectand then inside it, we are running the command npm init to start a new node project. You will be prompted to input information about your project. You can just press enter for every choice. if you wish to add information about your project go ahead. Now our node project is up and running. We are going to use webpack for bundling our code into one js file. So our Next step is to install webpack and webpack-dev-server . The webpack lib is used to bundle and output out js code in the location we specified. The webpack-dev-server lib will help us to run development server which will give use benefits like hmr & live reload . Basically, we told our app to make use of babel presets. By adding presets now babel can understand our es6/react code and can convert it to es5. We also installed a babel plugin which can understand the new rest/spread operator syntax. Let’s move on to webpack. As you already know we have to configure the webpack to make use of our babel loader to transpile and output our bundle.js file. We created a folder named webpack and inside it created an empty file webpack.dev.config.js. let’s add some loaders which will be responsible to bundle our source files. inside your webpack.dev.config.js below entry add these lines. As you can see we setup babel-loader for loading js/jsx files and used less-loader for loading less files. we didn’t install style-loader, css-loader & less-loader before so let’s install them. Our last step to end our webpack configuration will be providing the options for our dev server. Here is what our whole webpack.dev.config.js looks like I also added the parentDir variable to make referencing our parent directory easy. Now let’s create our index.html. Inside your project root dir create an index.html file. In our index.html we have a mount point <div id="app"></div> and we also added the source to our bundle.js file. We imported react & react-dom from their respective packages. Our main app will be inside the ./containers/App . Atlast we rendered our app into our main html node which is <div id="app"></div>. Open your App.js file inside it add this code. We create a simple component which will display This is my new react appwhen rendered. let’s check our app in the browser to see if it works or not. but before that let’s add a npm script which will help us to launch the dev server by just typing npm run dev in the console. now you are good to go. 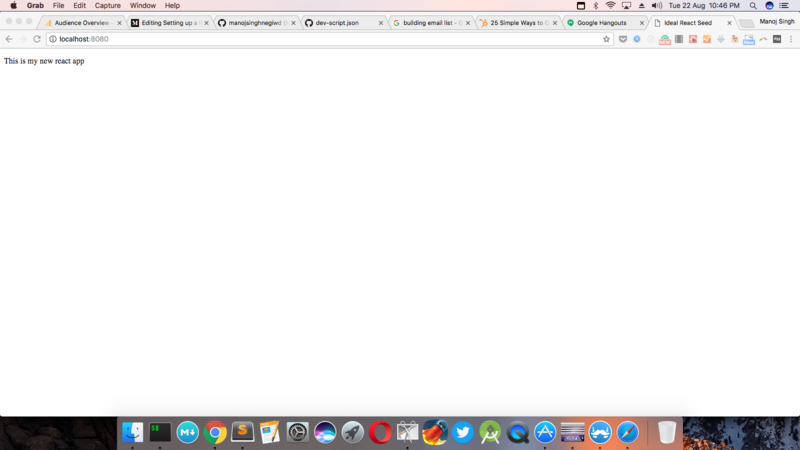 in your console type npm run dev and goto http://localhost:8080 you will see your app working perfectly. This is it for now. You can play with this setup for a while Here is the second part where I will be using redux & react-router in this project. Also there will be third a part as well where I will show you how to usewebpack for deploying this project from development to production. Until then share this tutorial with everyone who can find this tutorial helpful. Niranjan Reddy (@ursNj) is the CEO and co-founder of Riosh Technologies, Riosh Technologies is responsible for developing many user engaging products. I'm responsible for the company's overall vision and strategy as well as day-to-day operations. Since the beginning, I'm focused on simplicity and inspiring creativity through solving problems with thoughtful product design. As a result, Riosh Technologies has become the home for visual storytelling for everyone from celebrities, newsrooms and brands, to teens, musicians and anyone with a creative passion.